We love Mid-century modern houses! We want to see them at their best looking fresh and up to date. 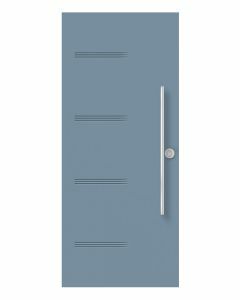 The new Era door is in perfect harmony with this style’s many assets: simplicity, asymmetry, and geometry. Painting this door in a vibrant color will add contrast to your facade's neutral and natural tones. Rediscover the exciting color palettes that made this type of architecture so memorable. Design tip Era’s assymetrical composition is designed to leave room for a pull bar or a 7" × 64" doorlite - perfect for adding light to a narrow entrance where there are no sidelites or transoms. Maximum non-standard dimensions for custom order : 33 3/4" to 35 3/4" x 70" to 79"
A 20-minute fire rating is available for this product in the N300 and N600 models only (see the "Technical Details" foldout for details), and only on products no larger than 36" x 80'', without doorglass. 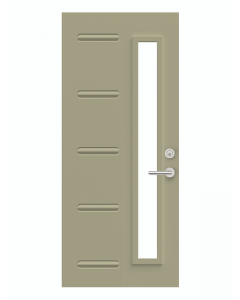 Optional closer and panic door (emergency exit) assemblies are available on this model. 10-year warranty on N600, N700 and N900 steel door. 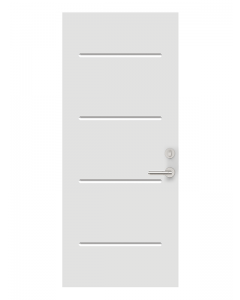 For all warranty details on steel doors, please see «Novatech Warranty - Steel doors».